Elver Barrios (center) and a few dozen other students held a mock graduation for undocumented immigrants behind the Legislative Building in downtown Raleigh. Five students walked 140 miles from Charlotte to Raleigh over the last 10 days to ask state lawmakers for in-state tuition for undocumented immigrants. Elver Barrios, a computer engineering student at Johnson C. Smith University, and one of the advocates, says that when the group left last week, momentum seemed on their side. "We were really excited on the first day of walking," he says. But walking 15 miles a day means blisters on the feet and lots of sun on the face. It turns out there’s not much shade between Charlotte and Raleigh. "Sometimes we would find, like, the speed limit sign, and luckily the sun was going in the opposite direction, so we could have like three square feet of shade," Barrios says. There isn't actually any legislation on the issue this year. But when the students arrived, some lawmakers were willing to consider it in the future, while skeptics say it’s a federal immigration issue. 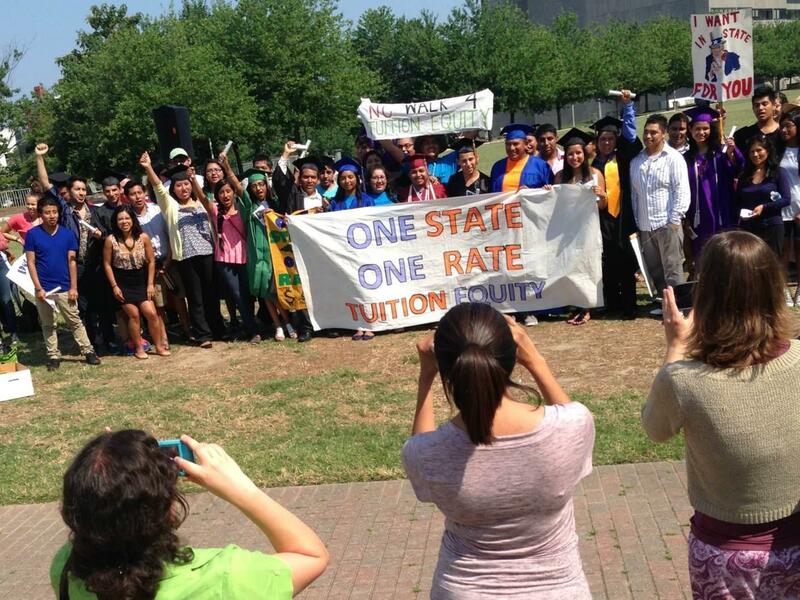 Barrios and a few dozen others held a mock graduation behind the Legislative Building in downtown Raleigh. Barrios says he's is hoping for a bill at the General Assembly next year. For now, he’s gone back Charlotte - in comfort. "The funny thing is that it took us like nine days to walk from Charlotte to Raleigh," he says with a laugh, "and we're going to drive in three hours back."